Naturalist, sculptor, and illustrator Tony Angell writes: "It was early summer and I looked across the open sea. Its surface gently heaved, suggesting the presence of some great being stirring within. ... In the bay below, a gang of a hundred gulls swirled, surged, and plunged into a herring ball near the surface..." Be sure to watch the amazing video of such a frenzy. More in Tony's book, Puget Sound Through an Artist's Eye. It was early summer and I looked across the open sea. Its surface gently heaved, suggesting the presence of some great being stirring within. 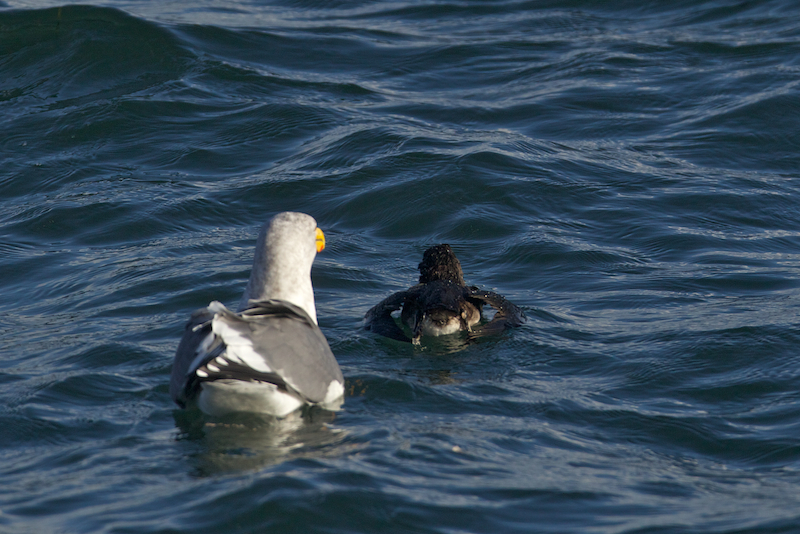 Using binoculars I followed hurried lines of cormorants, guillemots, scoters, and rhinoceros auklets. On a mission, their flight was straight ahead and sure. 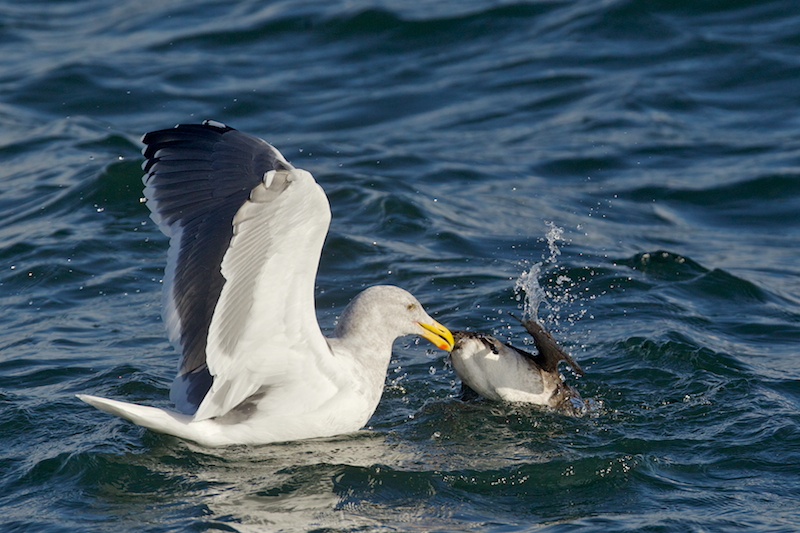 In the bay below, a gang of a hundred gulls swirled and surged and plunged into a herring ball near the surface. 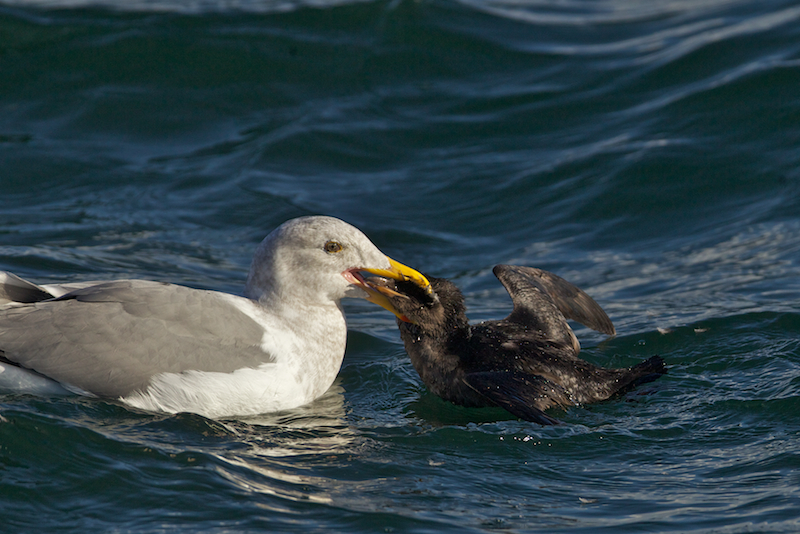 In all likelihood the fish had been herded there by diving auklets and murres or even a school of salmon. I could hear the frenzy in their calls as they competed for the food – and so, apparently, could other gulls, who detoured from their flight- line to join the melee. 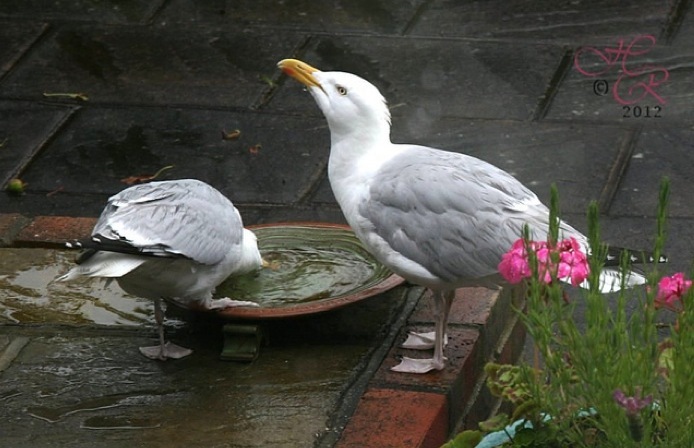 These cries rang like dinner bells to other gulls. 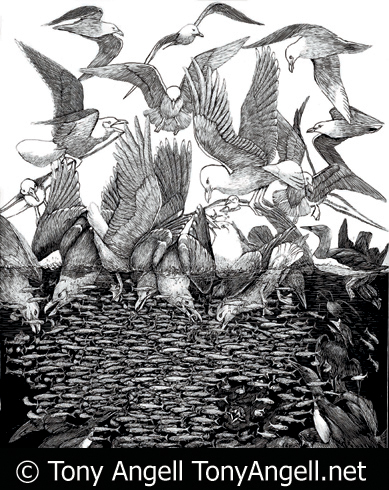 Glaucous-winged, Western, and Herring Gulls, cormorants, guillemots, scoters, and auklets – you can see them all as Tony has drawn and sculpted them, in his book Puget Sound Through an Artist’s Eye. And you can find a link on our website, birdnote.org. Call of the bird sounds provided by The Macaulay Library at the Cornell Lab of Ornithology, Ithaca, New York. Western Gulls recorded by C.A. Sutherland, Glaucous-winged Gulls recorded by E.S. Booth LNS 3348, and Herring Gulls by Martha Fisher. Water ambient recorded by C. Peterson Dec05G12T1 1:40. Video - Amazing whale, gull, murre feeding frenzy!